This is for my dear friend Anne who is today's featured Queen For The Day. 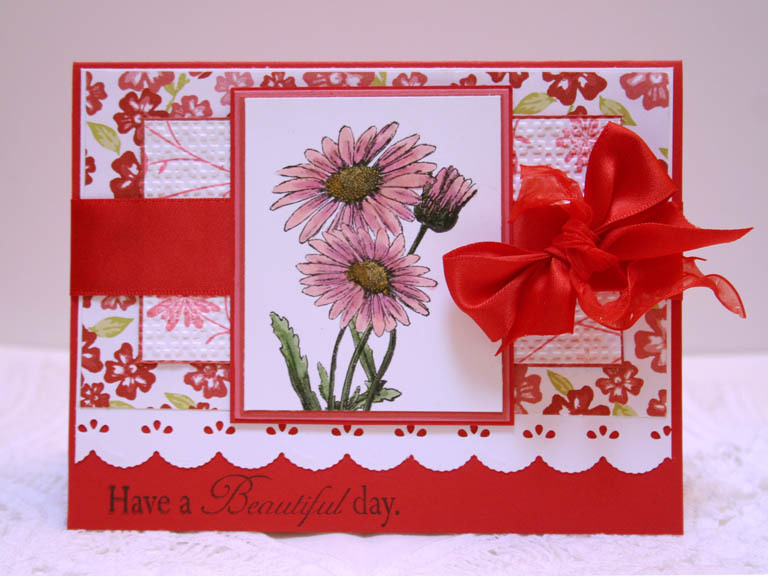 I used Mark's Finest Papers set called Greet The Day With Gerber and Anne's trademark color of red. 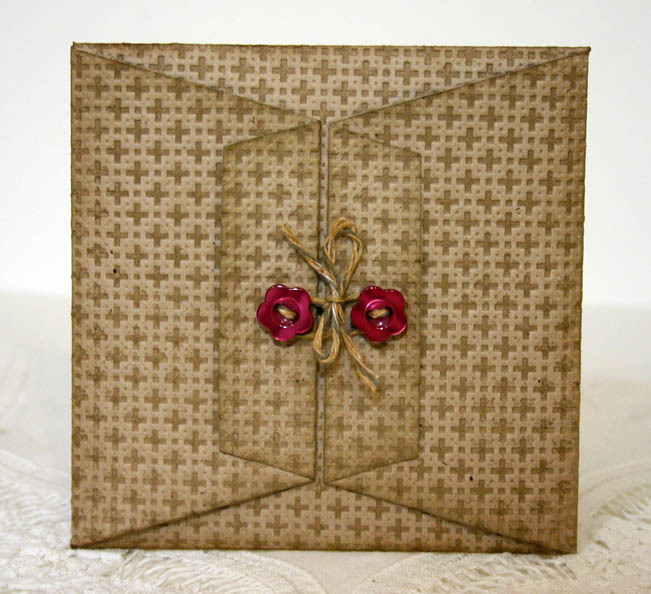 All supplies are Stampin' Up: Springtime Vintage paper, cardstocks of Baja, Artichoke, Whisper White, and Very Vanilla for punched flowers. I adapted the main image panel so it is a removable bookmark. The bottom panel is adhered on sides and bottom only to create the pocket. Embellished with Baja taffeta ribbon and Basful Blue brads. All supplies are Stampin' Up: Paisley Petals paper with cardstocks of Baja Breeze, Bashful Blue, Marina Mist. Pretties Kit stick pin with pearls, Baja taffeta ribbon used to embellish. 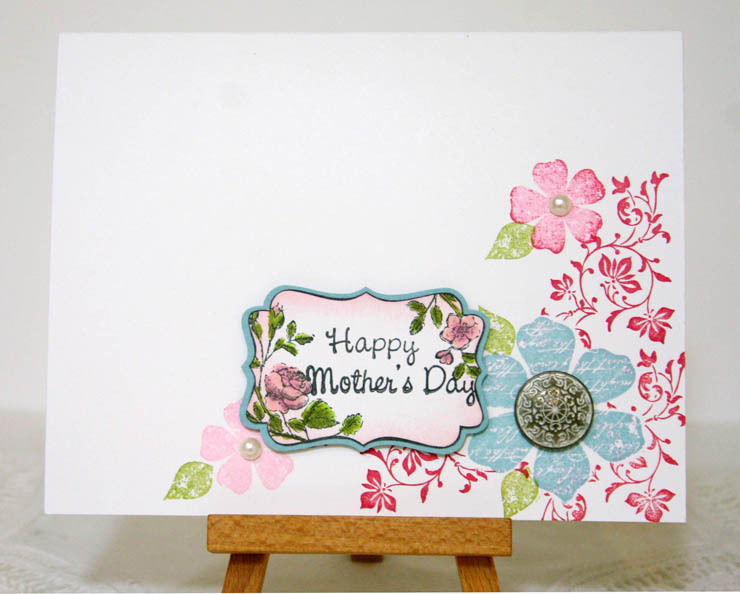 The stamp set is the classic keeper Garden Silhouettes. I came across this pretty little flower stamp a few years back at the Seattle CK convention. It is by Yvonne Albritton designs. 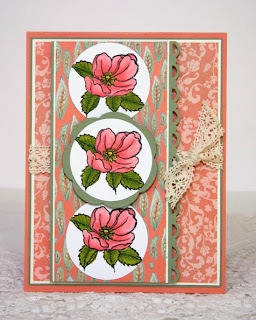 I colored it in Copic markers and used Stampin' Up's Paisley Petals paper with cardstocks of Groovy Guava, Very Vanilla, Whisper White, asnd Mellow Moss. 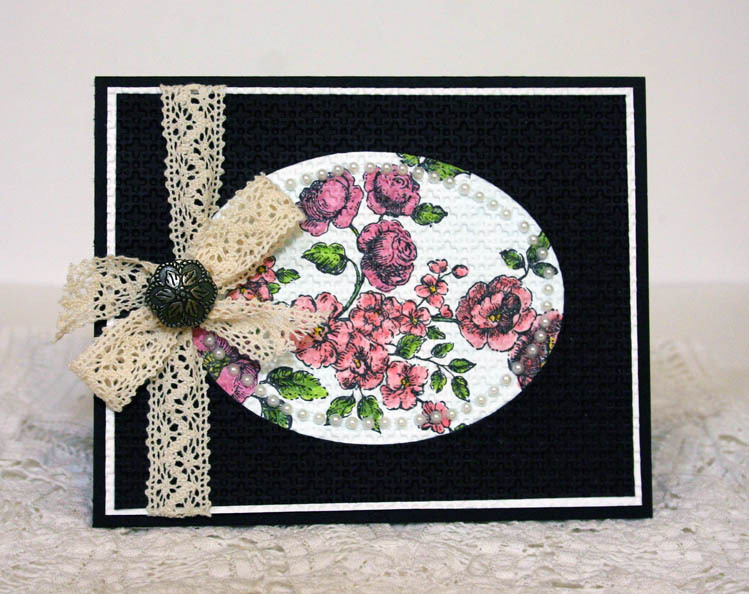 Chantilly lace to embellish. 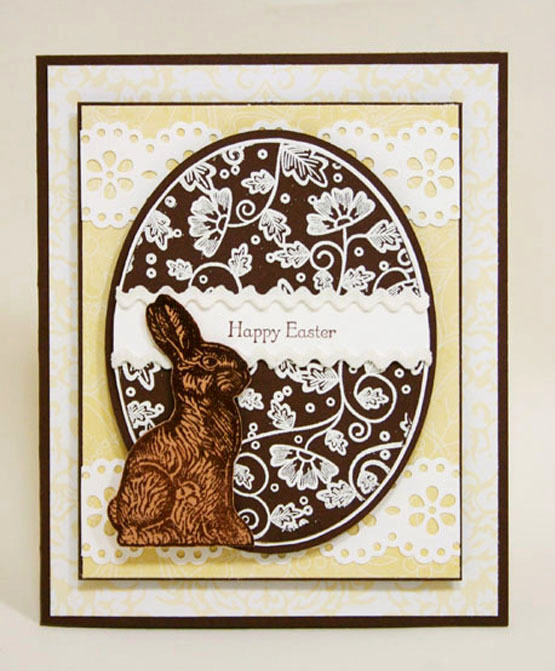 Now that Easter has arrived, it's on to the next card making day! No rest for the stamper, I tell ya. 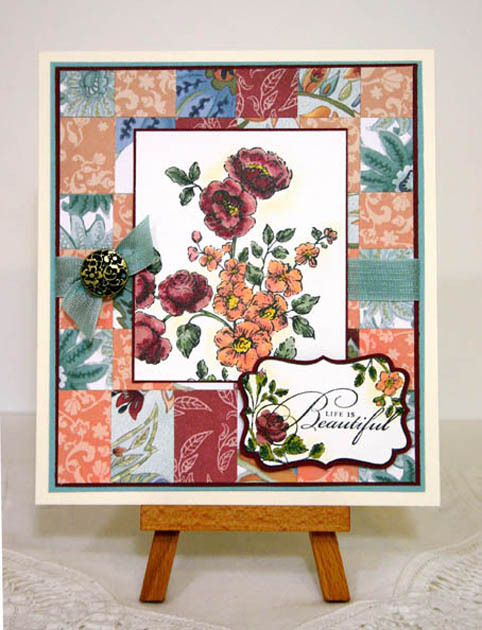 All supplies are Stampin' Up except for sentiment, which is Studio G. Vintage Vogue and Four Frames sets in Rose Red, Baja Breeze, Old Olive, and Pretty In Pink. Whisper White card base. Vintage brads and half pearls also by SU. 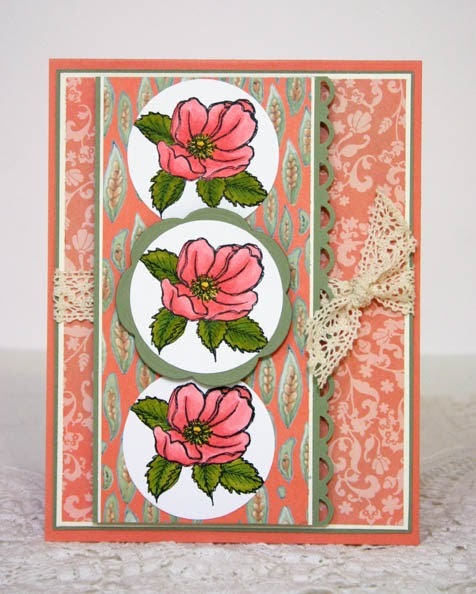 This card is a revised case of Shelly's(Fresh 'n Sassy on SCS). Enjoy your day today, may it be filled with many blessings and thoughts of the true meaning of Easter. 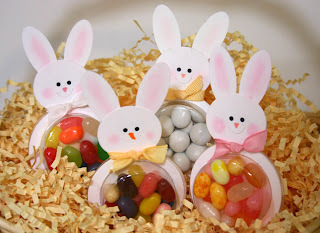 A fun way to dress up the jelly beans instead of just dumping them in the basket like I normally do. These were made using the Sizzix Snowman die, adding some ears with the SU medium oval punch, and the belly of sweet treat cups filled with Jelly Belly beans and some white chocolates in the one. For today's colors of Crumb Cake, Vanilla, and Concord Crush and for the teapot Tuesday tulip challenge. 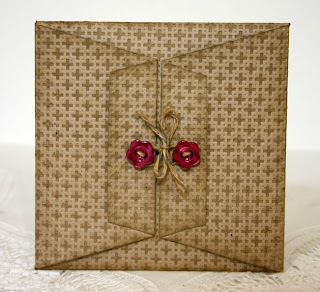 I like this card fold that closes to form it's own envelope. 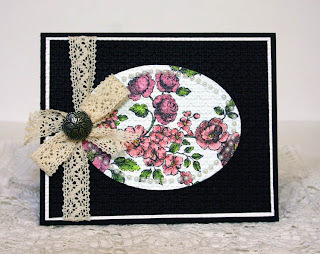 Stamp by Great Impressions, Lattice Square, buttons, and cardstocks by Stampin' Up. I couldn't find my linen thread so I used the new baker's twine and colored it with a Crumb Cake marker. 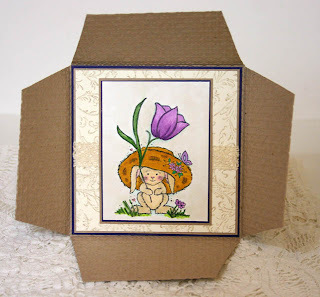 This older stamp is by Inkadinkado and is called Basket Of Blossoms. I have had it forever but this is the first time I used it. Lots of coloring scared me away, I suppose. 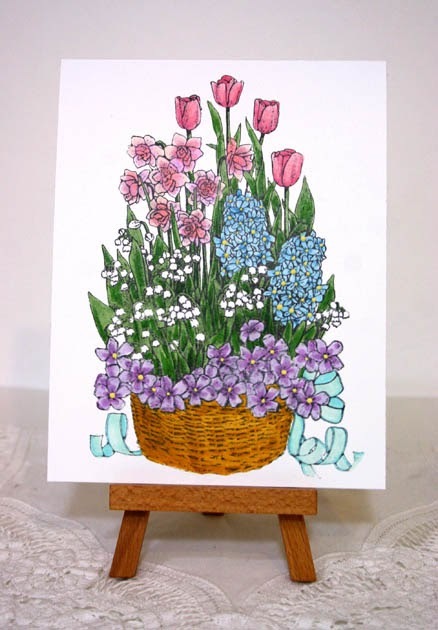 I colored the image with various Copic markers and added some Taffeta Cream acrylic paint dots to flowers centers. My garden tulips are blooming now and they are so lovely, Apricot Beauties mixed in with white narcissus with salmon centers. 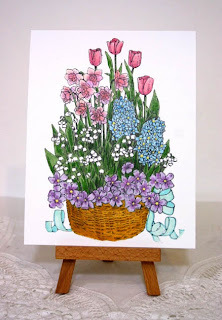 I just love spring flowers! 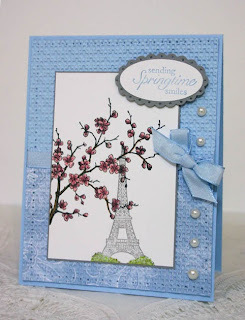 Paris in the springtime is one of those things on my to do list. For this card I combined a few challenges on Splitcoast to catch up a bit. All supplies are Stampin' Up: Bashful Blue with Paisley Petals designer paper, taffeta ribbon, pearls, and cherry blossoms and sentiment from Easter Blossoms set. I ran this through the Big Shot (the Billy Joel song always gets stuck in my head when I mention this piece of equipment)using the Lattice Squares folder and added some piercing to the edges for textured interest. Hope you are having a lovely spring day wherever you may be! 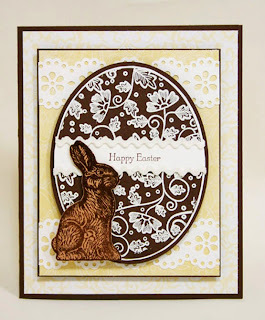 Here are a couple of older Easter projects that I really had fun making. 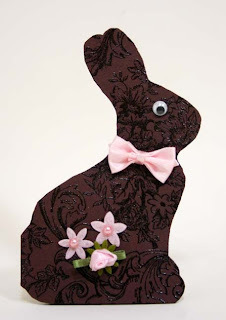 I found a bunny shape pattern on the Internet and adapted it to make a card(fold is on the side), and the second one I made to look like a chocolate egg. I made another with a decorated chocolate egg but can't seem to find it. 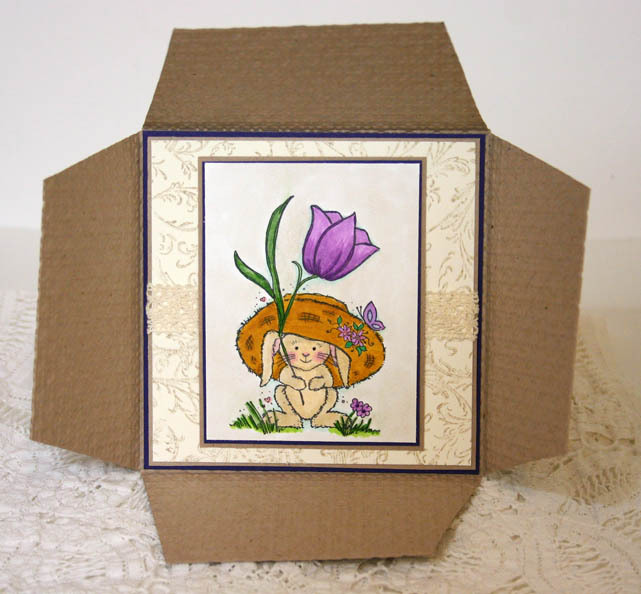 I'll keep looking and post when I do, it was my favorite Easter card ever! 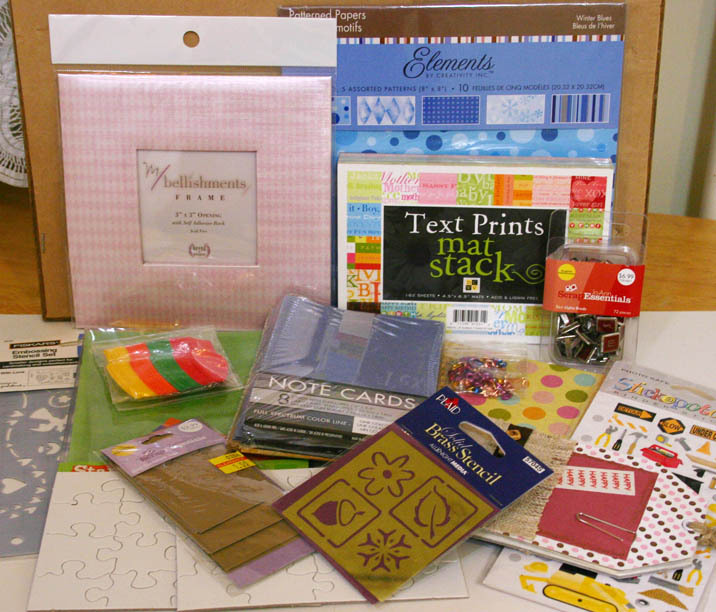 All supplies except for pearls are Stampin' Up. I used the embedded embossing technique on the front panel with the Lattice Squares folder and the Elements Of Style set. Antique brad, Chantilly lace and half pearls to complete. My son chose Teri (avid reader) as the winner of the blog candy. Congratulations Teri! Please let me know where to send the goodies! 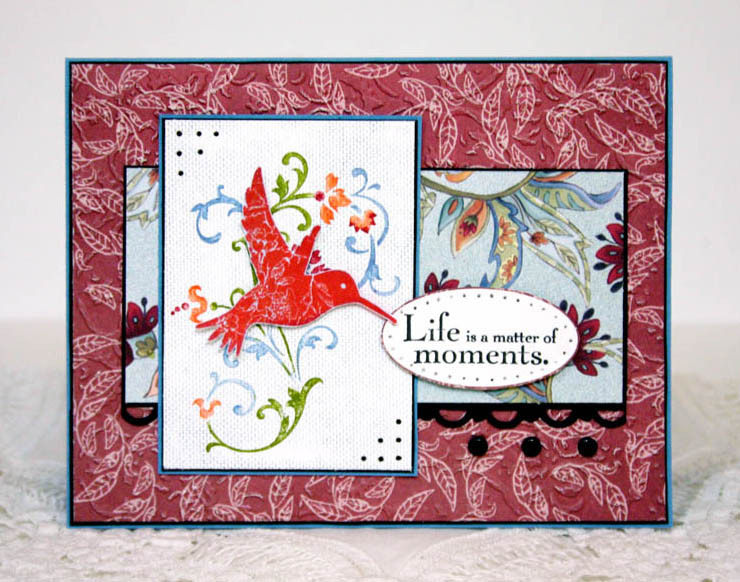 This is to honor last week's Featured Stamper Irene (DandI93). I curled and popped up the main image panel so it looked more like an pages in an open book using the Nestabilities dies. The paper is the new Paisley Petals, sentiment is Style Beautiful, and flowers are from Garden Silhouettes. (Stampin' Up). 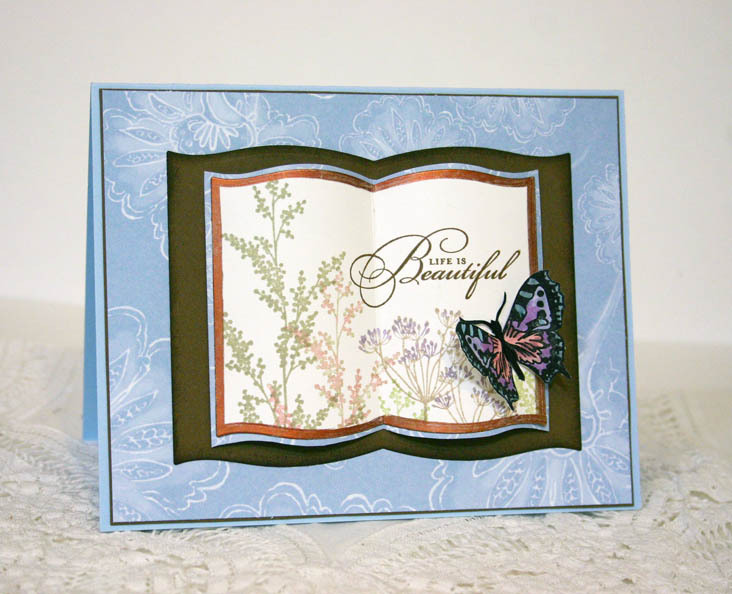 Butterfly is from Mark's Finest Papers Brick Wall set. 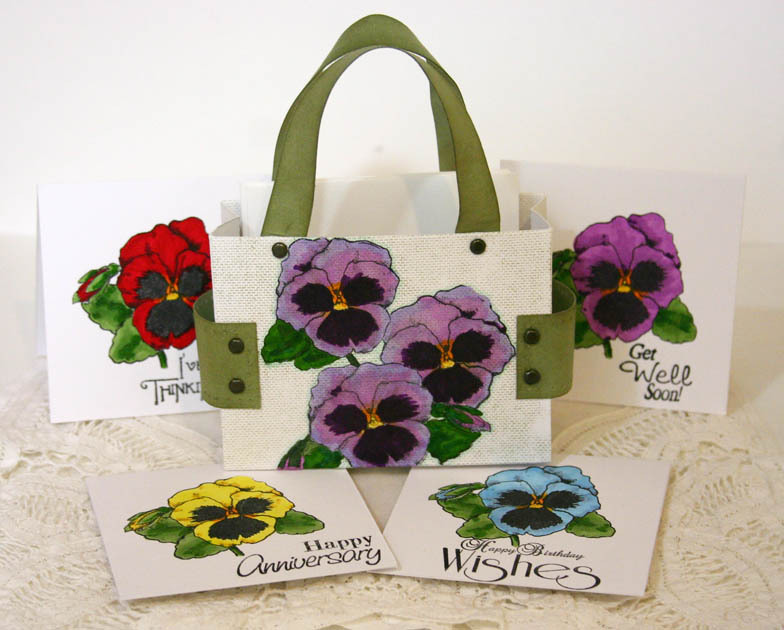 I made a little tote bag for 3" x 3" notecards for all occasions using the stamp set Happy Pansies by Mark's Finest Papers. 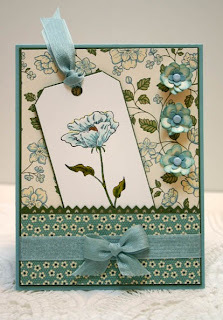 I stamped the white in Mellow Moss using the Linen background stamp to give it the look of texture and secured Moss strips and handles with SU vintage brads. 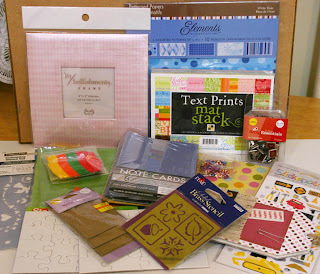 Cards are colored in Copics and have matching envelopes (in the tote). 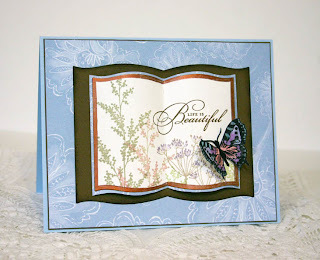 Designer paper is Basic Grey Porcelain, stamps by Stampin' Up. I made the rolled roses out of Pink Pirouette and Pretty In Pink cardstocks. This is the new SU paper Paisley Petals, from the Spring is Blossoming promotion. I combined with the Elements Of Style stamp set. Ran main panel through the Big Shot using the Vintage Wallpaper folder. 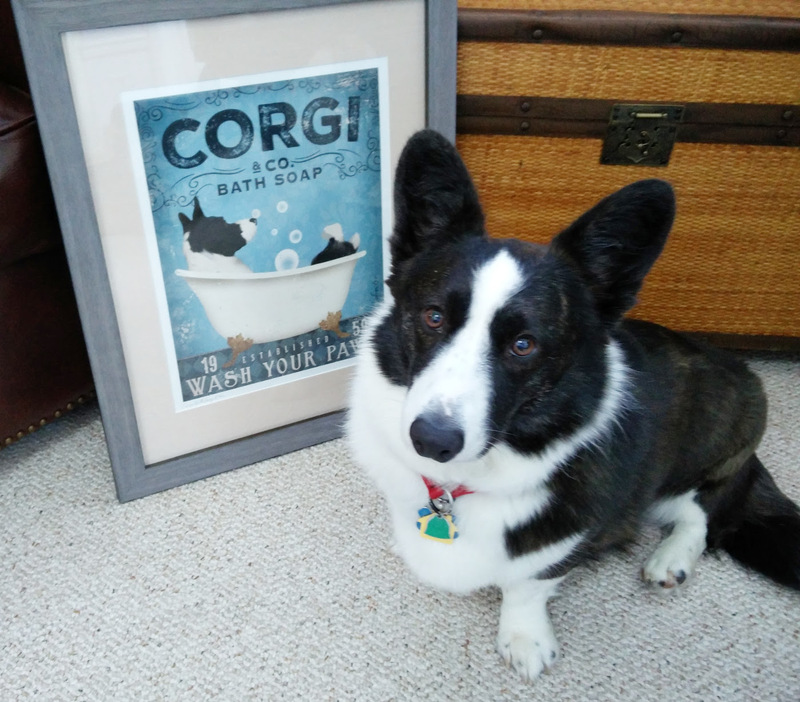 I am giving away the items shown here in the picture to celebrate my 1000th blog post. Simply leave a comment and a way to contact you if you don't have a blog and my son will draw a random name next Sunday, April 10th. 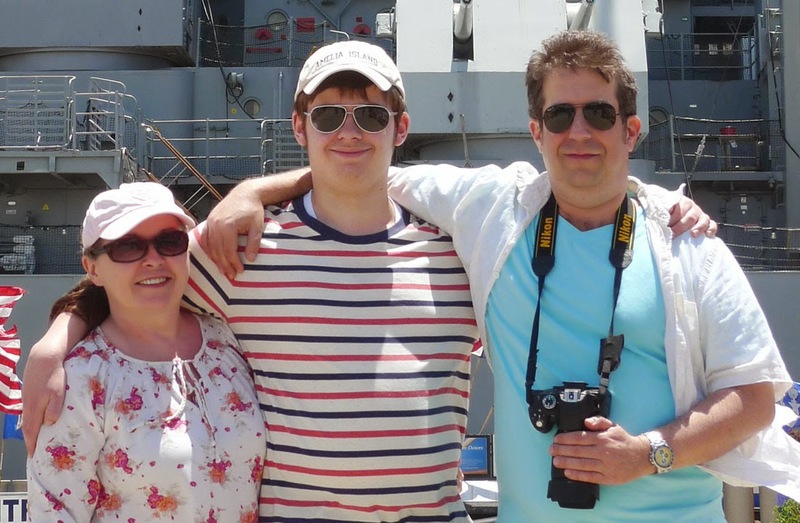 I have donated approximately 6oo cards to our troops through Operation Write Home and various other card drives that collect cards for our troops to send home to their families. These men and women do so much for us, I feel it is a little something I can personally do to show my appreciation. The rest of the cards I am saving to maybe open up a little on line card shop someday soon! Happy stamping and thanks again for taking the time to come and visit me! 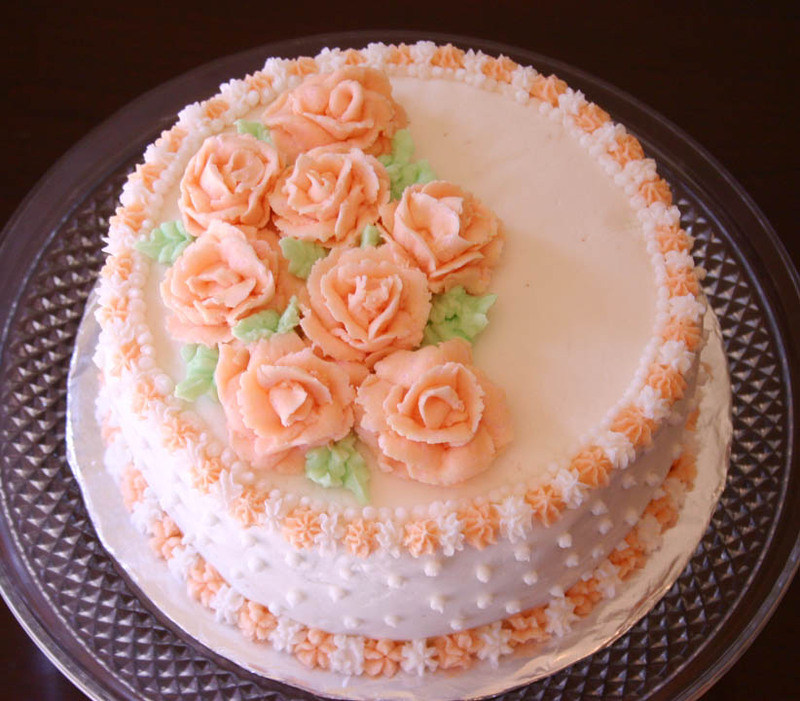 We completed our Wilton Basic Decorating class yesterday and this was my first completed decorated cake. What a lot of fun! 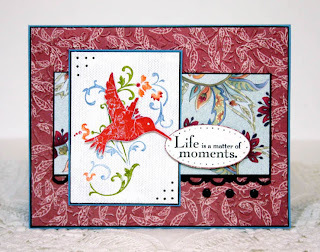 This marks my 1000th blog post at Sleepy In Seattle Stamps. Wow, I need to get a hobby! Please stop by later in the day as I will be posting a blog candy giveaway to celebrate. Thank you all for stopping by to visit, it means a lot to me. 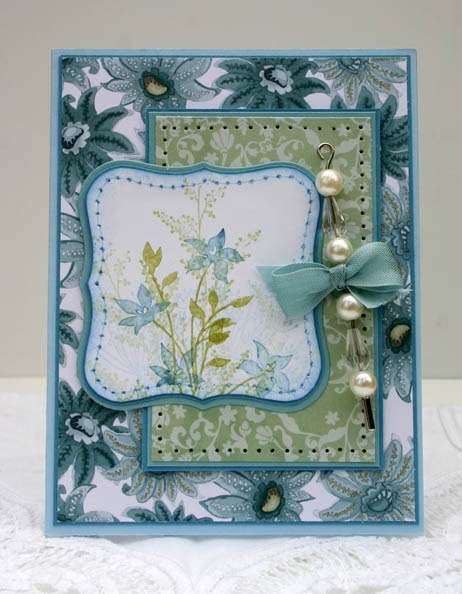 Today's card combines a few challenges, the Bargello technique from Splitcoast this week, my amiga Sharon's challenge to make a quilt card and the inspiration challenge today. All supplies are Stampin' Up: the new designer paper is Paisley Petals (love this!) 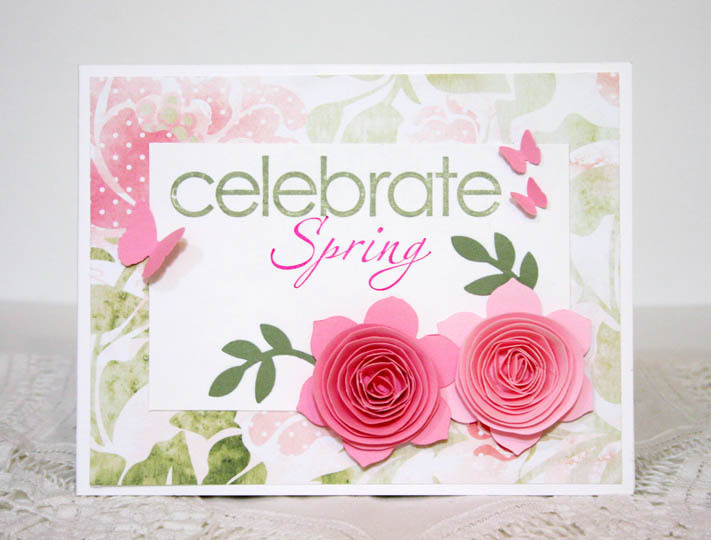 available now in the Spring Is Blossoming promotion. Stamp sets are Elements Of Style, Style Beautiful, and the new Four Frames and coordinating punch.